Michael is originally from Scotland and is now a resident of West Cork. Drawing inspiration from the area, Michael exhibits frequently and has sold paintings and drawings at Uillinn, West Cork Art Centre. Michael also shared some insights on some other extraordinary creatures he created for the festival over the past few years e.g. the Chaincrow and Kelpie the sea monster! What inspired you to create the Scary Crow aka Jimmy? The idea came to me one day while waiting at the bus stop in Leap. I found myself watching a large murder of crows gathering, the sound became so raucous I could not help but cast an anxious skyward glance. This inspired me to get to work and I set about planning the construction of the Scary Crow. How did you go about building him? My partner Isabella and her daughter Charlotte helped with the construction, we purchased some wood and made a wooden frame. We got pictures of crows from the internet to study the anatomy and shape. It was relatively easy to do the main shape. We used black plastic piping that plumbers use and screwed it straight into the wood to secure it. Although it wasn’t a natural material it was designed to last. Tell us how you created the head and his extraordinary beak? What is the eye ball made of, it’s amazing? Charlotte wanted to create a large eyeball to place in the crow’s break so we purchased a football. She then used spray paint to get the colour subtle enough to represent the Iris. We used some solar lights bunched together to give the crow glowing eyes. That helped make the scarecrow look a bit more sophisticated. The wall your selected overlooking the ravine was genius, the perfect perch, how did you manage to secure him on the wall? Ted O’Donovan helped me put a couple of posts on the wall and lift the Scary Crow into place. We were a little worried that it could fall over but the construction was well balanced. It lasted very well even during some rough weather! During autumn of 2015 a fierce storm blew down a number of trees on our land. 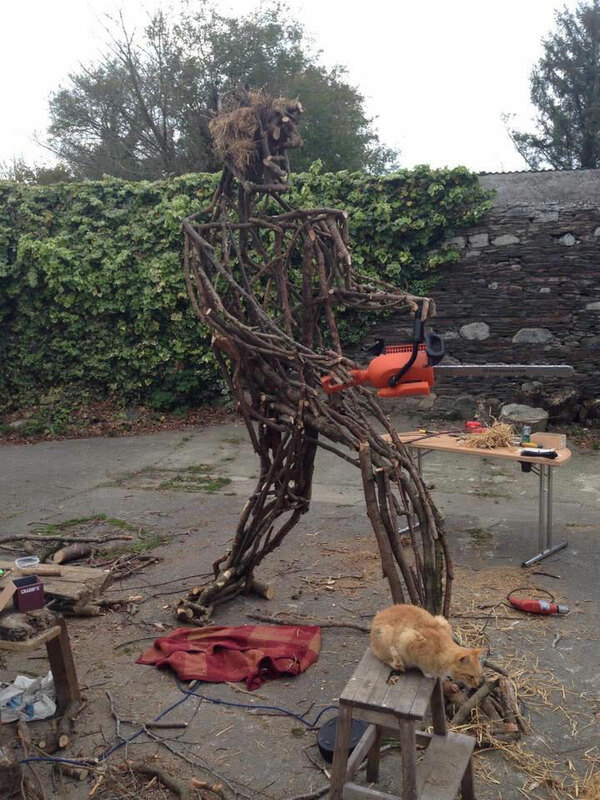 As Isabella, Charlotte and I picked up the fallen branches, we decided to make a scarecrow from all the wood and we thought let’s make a chain-crow – a figure with a chainsaw. We looked for slightly curved branches to form a ribcage fitting a lot of little pieces together to make up a head, neck and arms, drilling holes and screwing all the pieces together as we went along. The sculpture we ended up with was not quite anatomically correct – if that’s a concern of yours be sure to study your own body anatomy. Look at the way your own hands, arms and legs twist around and look for pieces of wood that follow the same shapes. Charlotte made the chainsaw from plastic bottles she cut using her vinyl cutting machine and the teeth of the chainsaw were glued drink can ring pulls. In comparison to the wooden crow which is much more fluid, the chainsaw was made very neat and precisely. 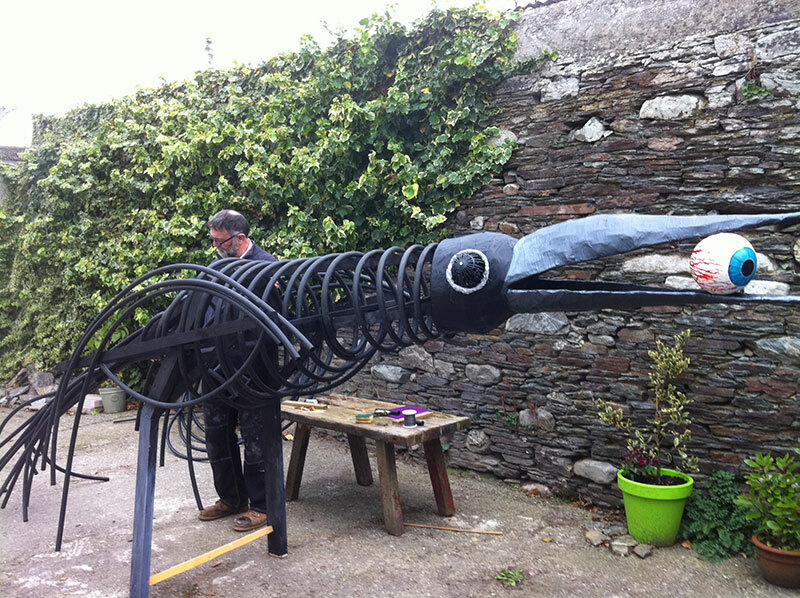 We had a great time making our chain-crow figure which now close the ravine near Ger’s Diner. In 2017, Isabella, Charlotte and I were asked by the Scarecrow Committee if we could make a scarecrow to be fixed in Leap harbour on top of a pontoon that was visible from the road. 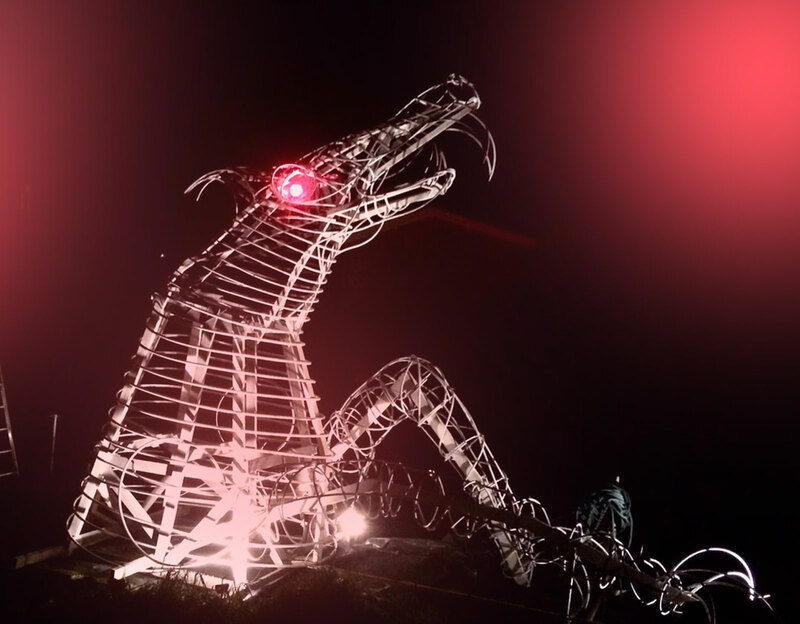 The idea for Kelpie came after researching sea monsters in Irish mythology when we happened upon one also known in Scotland called the Kelpie. The story goes that this seahorse comes ashore to take somebody on his back and then disappears back into the sea. A wooden structure and black plastic pipe created the shape which we painted all white and Isabella painstakingly cut out beautiful seaweed shapes from black plastic used as a membrane doing the building work. Getting an 18 feet high structure on top of the pontoon was a challenge. With the help of 8 men, Kelpie was lifted through the mud and tied to a digger whilst some of the land was excavated so the digger would have a place to move to. Eventually, it was dragged into the water to float and we were able to position it on the pontoon where it could be illuminated. It was a great community effort and we couldn’t have done it without the ingenuity of everyone who helped. 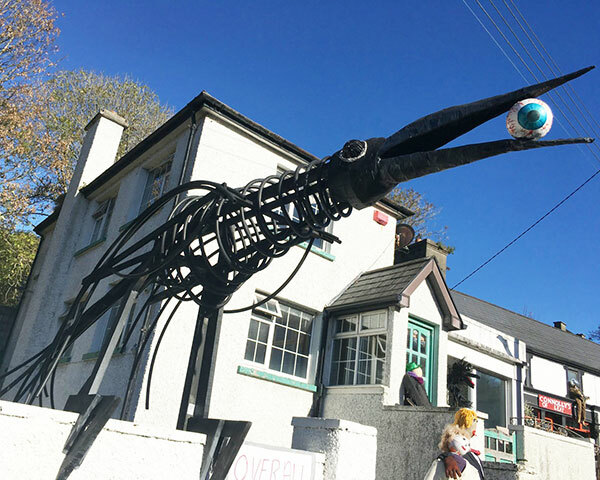 Following the Festival we brought the monster to the shore and hoisted it outside the Leap Inn, it has since been moved to the sea front on the Leap to Skibbereen road.